Tax law touches nearly every aspect of the law and is critical to the practice of corporate law, estate planning, business planning and property law. For lawyers with specialized knowledge of tax law, the ubiquity of state and federal tax codes presents the opportunity for a challenging and rewarding career. Many law schools offer advanced law degrees, or LL.M. degrees, in tax law, which can be extremely valuable to employers. But law students do not need to wait until after earning their J.D.s to pursue this practice area. A number of law schools offer concentrations, certificates, clinics and externships designed to prepare students to enter the profession with a solid understanding of tax law. At Benjamin N. Cardozo School of Law, Yeshiva University, students can complete a concentration in tax law choosing from a wealth of specialized courses. Full-time faculty, as opposed to adjunct and visiting professors, teach most of the tax law courses. Edward Zelinsky, a tax law scholar and professor at Cardozo School of Law, said the availability of professors to answer questions and discuss tax issues provides a tremendous advantage. Students at Cardozo School of Law also have the benefit of geography. It is situated in downtown Manhattan at the epicenter of tax law transactions. 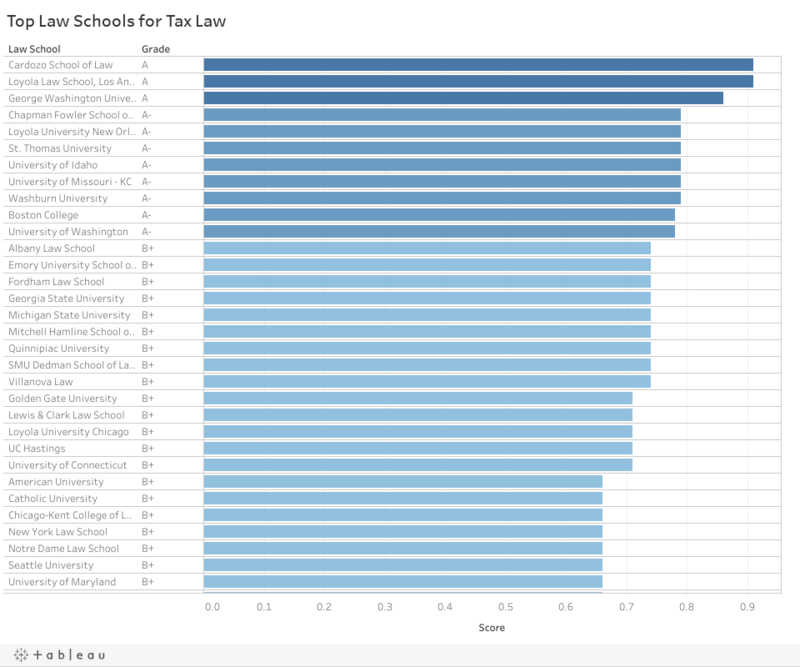 For law students interested in practicing tax law in the public sector, Washington, D.C., is one of the top places to be. At The George Washington University Law School, for example, students can take basic and advanced tax law courses. But that is not all. Students also have the opportunity to tour the U.S. Tax Court and attend tax career panels hosted by prominent lawyers from local firms and legislative tax-writing committees. In addition, the law school offers participation in the Volunteer Income Tax Assistance program, alumni meet-and-greets for tax career advice and a fun event called Tax Movie Night. West Coast law students have similar opportunities to study tax law in top-ranked programs. At Loyola Law School, Los Angeles, students can participate in four different tax clinics. The programs include the IRS Small Case Tax Clinic, the Nonprofit Tax & Transactional Clinic, the Sales & Use Tax Clinic and the State Income Tax Clinic. By participating in the State Income Tax Clinic and the Sales & Use Tax Clinic, students at Loyola have the opportunity to work under the supervision of California State Board of Equalization attorneys. Students provide representation to members of the public who have qualifying sales and use tax matters pending with the board. Students interview and counsel their clients, write legal memorandums and briefs and may even represent clients at appeals conferences and oral hearings before the board. Just a short drive away is Chapman University Fowler School of Law, where students work in the Appellate Tax Advocacy Clinic, the only appellate-level clinic focused specifically on tax law. Students participate in docketed appellate tax cases by writing amicus curiae briefs for matters affecting federal, state or local tax law. Meanwhile Chapman Law’s Tax Clinic assists clients at the trial level. Students represent low-income taxpayers before the IRS and U.S. Tax Court and, in many cases, are able to settle tax disputes with the IRS. If settlement efforts fail, students have the opportunity to take the case to trial. When the clinic started, the IRS was skeptical, Chapman Law Professor George Willis said. There is a real benefit to studying and practicing tax law during law school, Willis added. “Students that graduate from our program will hopefully be able to recognize and understand the tax consequences of whatever they are working on,” he said. By graduating with a concentration in tax law, students can demonstrate to employers that they have a solid grasp on the basics of tax law, giving them a leg up when searching for jobs after graduation. Read the preLaw Fall 2017 issue to see which schools made our Top Law Schools for Tax Law.